An important development in the history of BMW's long-running flat-twin occurred in 1936 with the introduction of a welded, tubular steel frame on the R5 model, replacing the pressed steel chassis used hitherto. The R5's 500cc overhead-valve engine likewise was new and the following year a 600cc side valve derivative was introduced on the R6, a touring model intended for sidecar duty. 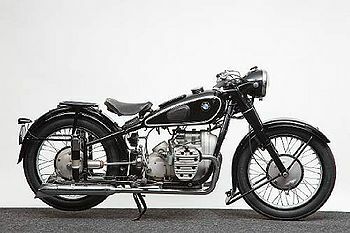 In 1938 the R5 and R6 were updated, gaining a telescopic front fork and plunger rear suspension to become the R51 and R61, while the range was further extended by the introduction of a bored-out-to-750cc version of the latter – the BMW R71. The R71 engine only produced a relatively modest 22bhp but its biggest virtue was exceptional flexibility, which was just what its intended market required. Approximately 1,800 R71s had been made by the time production ceased in 1941. Post-war the design was revived in the USSR as the Ural. This page was last edited on 23 December 2018, at 20:03.